Little O loved painting snowmen so much the other day that she asked to paint immediately after breakfast this morning. I didn't want to do the exact same painting that we did before because I want to keep it fresh and new for her. Plus, if we do different things with paint, it will keep her occupied for longer. 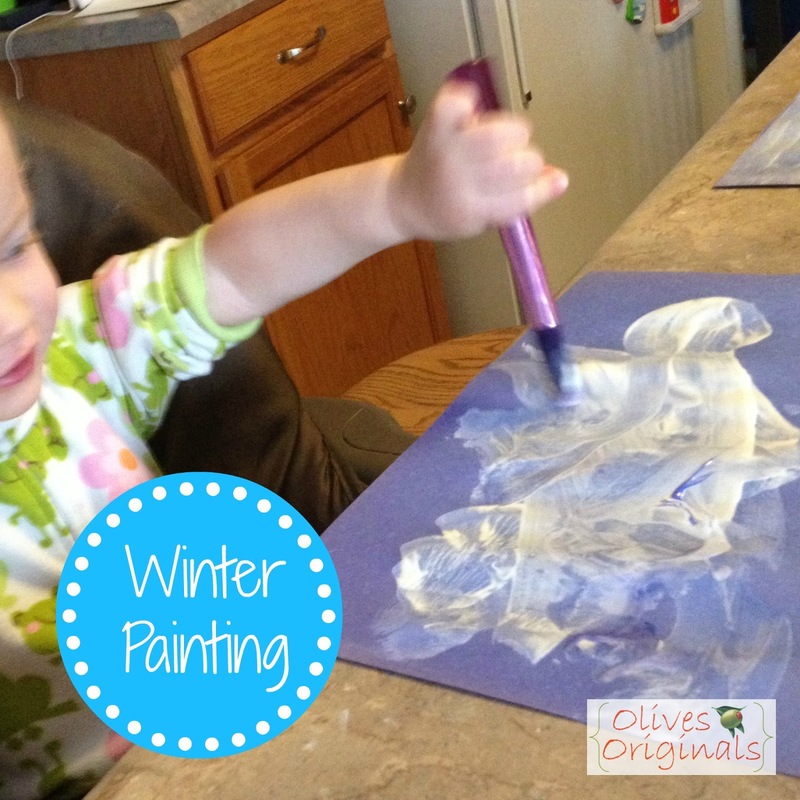 This time we used blue construction paper and white and blue tempera paint. I didn't water it down at all because I wanted the paint to be opaque. While we painted, we talked about winter, snow, and snowmen. I reminded her of the snowmen we painted and the ones we made out of playdough. I painted a snowman next to her, and I told her that I made the body using circles. She said he needed eyes (one of her newest words is "eyes"), so I painted on eyes, a nose, and a mouth with blue paint. I added buttons and arms too. Finally, I wanted her to try a different technique with her paintbrush. She spent most of her time brushing on the paint in smooth strokes. I told her I wanted my picture to look like it was snowing. So I started dotting paint on the background. She started doing the same ( her dots are large in the upper left corner). She decided to liked to brush the paint on better, so she went back to that. Hey, at least she tried it, right? This was a quick, fun painting activity. Little O seemed to really enjoy it. I'm sure we will be busting out the paints again soon. I think this may be the first time we've painted together on colored paper.